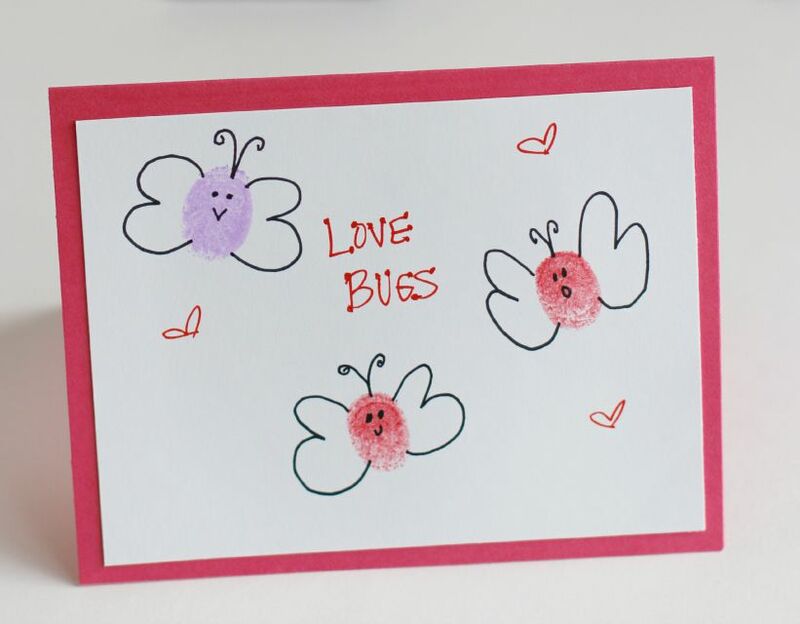 The kids will love to stamp up these cute Love Bug cards! They are perfect for Valentine's day to make for loved ones. Even a classroom party craft or for your classmates as a Valentine. With your paper and stamps, press your thumb onto the stamp ink and press it onto the paper. Make thumbprint marks anywhere you'd like your bugs to be on the paper. Use a marker or crayon to draw your thumbprints into a bug shape. We made our bugs into butterflies! We even gave them faces as well. - Will you be my Love Bug? - I'm Your Love Bug, Valentine! Fold your card paper in half. You'll want to make sure it's slightly larger than the white paper so the pink paper gives the white paper a border. With glue, a glue stick preferred, glue your white thumbprint paper onto the folded card. TIP: You could glue this onto the front or onto the inside of the card. Now you're done and it's ready to give to your Valentine!